A ferocious, restless energy characterizes Brahms’ Piano Quintet in F Minor, Op. 34. It’s music which is constantly developing and evolving from the smallest motivic seed. At first Brahms wrestled to find the right instrumentation. The music started out as a string quartet, developed into a sonata for two pianos and then, on the recommendation of Clara Schumann, found its true form as a marriage of piano and strings. This evolution is similar to the compositional process of the First Piano Concerto, which was originally intended to be a symphony. It’s almost as if the piece was telling Brahms what it wanted to be as he composed. 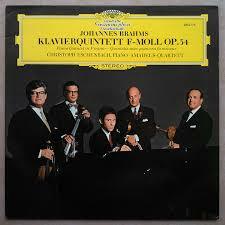 Brahms completed the Piano Quintet in 1864, when he was in his early 30s. Listen for complex rhythmic shifts-moments where you might lose track of the downbeat. Also, listen for the reference to Beethoven’s Late String Quartets in the opening of the last movement. Didn’t know that Clara Wieck-Schumann had such an influence on Brahms composing this quintet. That fact made me admire her even more. It’s a work that lifts me up and takes me into a world long forgotten. This recording is very good, but the Amadeus Quartett is much more better again with Clifford Curzon in a Nov. 1974 live recording at the Royal Festival Hall London (BBC Legends), which is a very exciting performance!…. Note also the very good recording of the Quartetto Italiano with Maurizio Pollini which gives to this music a sort of latin touch. Thank you for taking the time to share your thoughts on these recordings, Claude. I will enjoy exploring your recommendations. 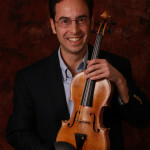 I’ve also taken a look on your blog about your violin school, that’s so nice to see all these young children learning to play violin with a such teacher….this must be a real enjoyment for you….